Dental bonding is a option to repair decayed teeth, repair chipped or cracked teeth, to close spaces between teeth, make teeth look longer, change the shape of teeth, and as a cosmetic alternative to amalgam fillings. It can also be used to protect a portion of the tooth’s root that has been exposed to gum recession. Little preparation is needed for dental bonding. Anesthesia is often not necessary unless the bonding is used to fill a decayed tooth. A shade guide is used to select a composite resin color that will closely match the color of your tooth. 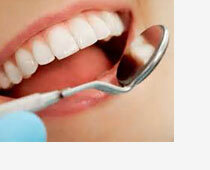 Dental Bonding is the least expensive cosmetic dental procedure. Unlike veneers and crowns, which are customized tooth coverings manufactured in a lab, bonding can be done in one office visit unless several teeth are involved. Compared to veneers and crowns, minimal tooth enamel is removed. Although the material used in dental bonding is somewhat stain resistant, it does not resist stains as well as crowns. Bonding materials do not last as long nor are as strong as other restorative procedures, such as crowns, veneers, or fillings. Additionally, bonding materials can chip and break off the tooth.